Last week, my sister gave me the book Einstein on Peace by Otto Nathan and Heinz Norden. Published in 1960, it’s a comprehensive picture of Einstein from 1914, when he left Switzerland to settle in Berlin, through his death in 1955. Using quotes from articles, papers, and letters, the book brings to life more than 40 years of Einstein’s lifelong struggle to abolish war and find peaceful solutions to conflict. It includes his pacifist awakening during WWI, being targeted by Hitler, and fleeing Germany to save his own life. 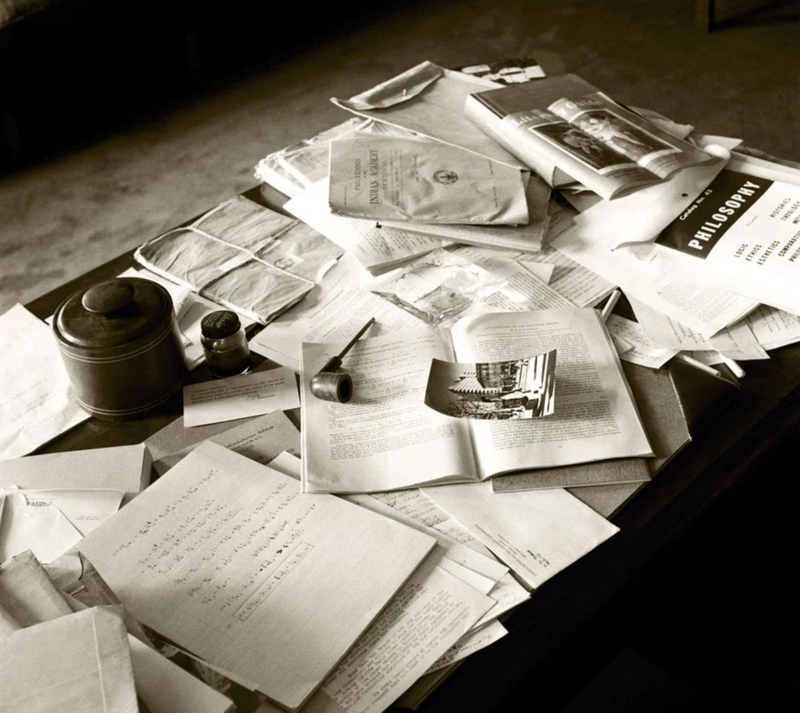 Einstein’s desk at Princeton on the day he died, April 18, 1955. Photo: Ralph Morse, Time & Life Pictures, Getty Images. Through all the years that I’ve talked to my Imagined Einstein, I’ve never read this book. The parallels to what I’ve learned from him in Afterlife are simply astounding. Of particular interest to me are his thoughts about the Nazi uprising in Germany and how they targeted him personally. I’ve long felt my Imagined Einstein has come back to share the wisdom he acquired during that time, as the world now moves dangerously close to what he warned us could happen. The slander against Einstein was done with the intention to declare him an enemy of the state, which would then allow them to seize his property and denounce his efforts to confront their tyranny. Wisely, Einstein had transferred assets to the US. 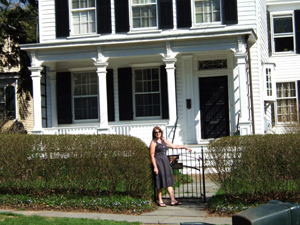 Though he had taken a job at Princeton, he had not intended to move there. As a member of the Prussian Academy of Sciences, he was planning to spend his summers in Berlin. But when Hitler and the Nazis came after him, moving to the US seemed most prudent. 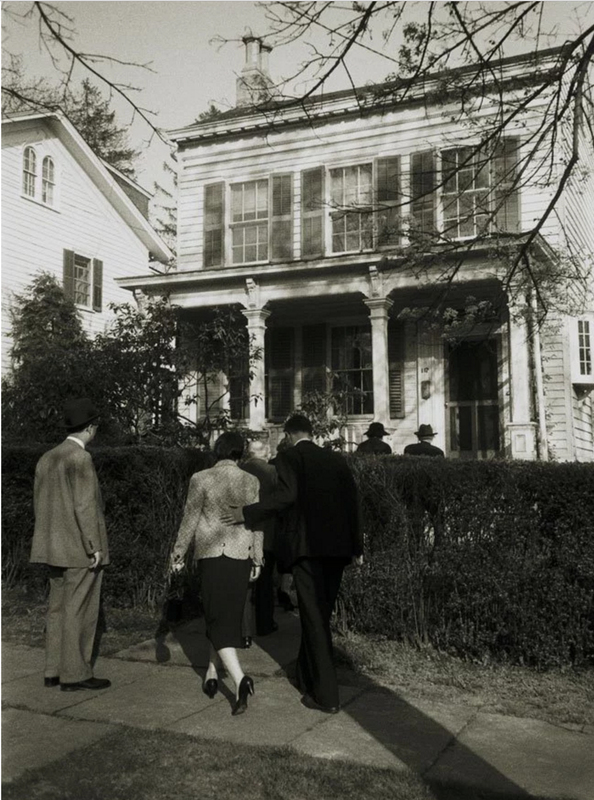 Einstein’s home in Princeton the day of his funeral, April 1955. Photo: Ralph Morse, Time & Life Pictures, Getty Images. Those were his last written words. Is it really such a stretch to consider that, upon his passing, he would explore the nature of life after death? Who else but Einstein was brilliant enough to figure out the reality of Afterlife, formulate a theory to create “world peace, one person at a time, starting with each individual,” then communicate his findings back to those of us in bodies and inspire us to test his process? And to the question I ask myself constantly, “Why me?” Why not me? It had to be someone. I am just sane enough to consider his message seriously and still crazy enough to step forward and agree to be his emissary. What I do know is that my Imagined Einstein’s unified field theory, maps of human consciousness and Conflict REVOLUTION present a practical avenue for creating peace, one person at a time. People around the world, myself included, have used Con Rev to transform our lives and create miraculous outcomes that could not have been achieved by addressing the conflicts at the level at which they were being created. So what will it take to get you to stand up? Join us! Free! Read more! Enter your email address to follow Einstein & The Party of Twelve and receive notifications of new posts by email.